On Saturday, a weak clipper system is going to push across the northern Great Lakes into eastern Canada. This system won't produce anything here, but it will be the clipper's trailing cold front that sets up our storm for Sunday night-Monday night. An area of low pressure is going to develop somewhere across the Ark-La-Tex and ride along this boundary. A cold high pressure system will try to work in and edge the front farther south as we head throughout the later part of the day on Sunday and into Monday. This is going to lead to precipitation beginning as rain until enough cold air works in behind the front to change things over to wintry precipitation. We are getting late enough in the winter that cold air masses aren't strong enough to push all the way to the Gulf states. Sunday will end up being quite warm since we'll still be on the south side of the cold front. High temperatures will range from the upper 40s across far northern Virginia, to as high as the upper 50s and low 60s across the southside. Rain will breakout across western areas Sunday night as the cold front continues to slowly dive south and allows temperatures to crash. By Monday morning, most of the central and northern Shenandoah Valley and greater DC area should be all snow. This rain/snow line will continue to push south and east throughout the day. 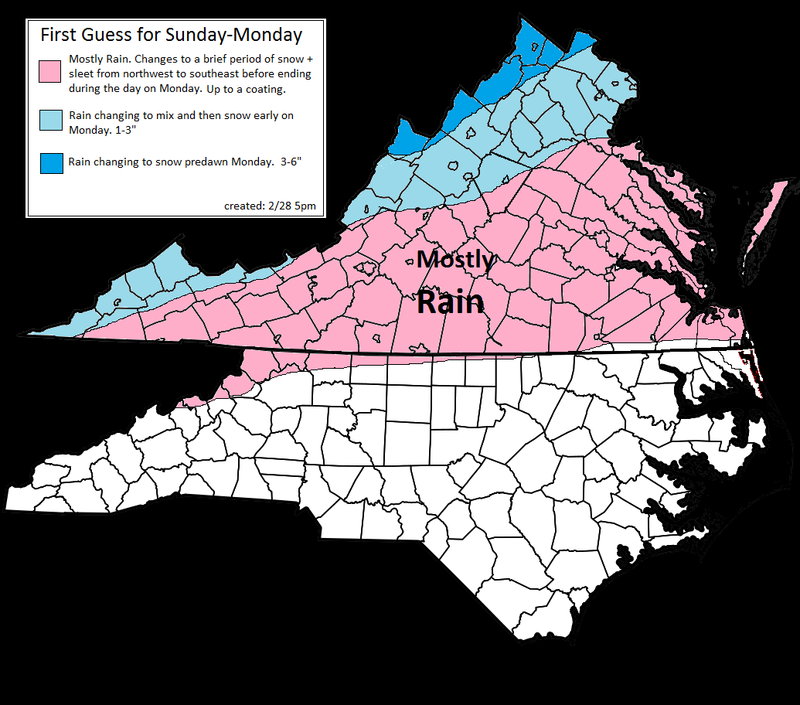 I think even southeastern areas see rain change to snow before ending. Below are my thoughts right now. This is looking like a moderate late-season event for most. Probably enough to cause some school problems on Monday. I'll update this tomorrow evening.